How to Make a Fruit Tart. This fruit tart is an elegant dessert you can make at home with our tart crust recipe (see related eHow). Or you can take a shortcut and use a premade tart shell. Serves 6 to 8 as a dessert. On a floured surface, roll out the dough into a round about 1/8-inch thick. Use more flour if the dough sticks. Working quickly, place the dough in a 10-inch tart pan by rolling it onto your rolling pin and unrolling it over the pan. Tuck the dough into the corners of the pan. Remove excess dough from the pan rim by rolling the pin over the top of the pan. Chill the pan in the refrigerator for at least 20 minutes. Prick the bottom of the dough with a fork to allow steam to escape as the shell bakes. Place a round of parchment paper over the dough, and pour dry beans, or a comparable substitute, on the paper to keep the bottom of the crust from puffing up. Bake for 15 minutes, and then cool to room temperature. Bring the milk and vanilla to a boil, and then remove from the heat. Beat egg yolks with sugar in a medium bowl until thick and pale. Beat in flour and cornstarch. Whisk the hot milk into the eggs vigorously. Return to saucepan and place over medium heat. Whisk constantly until mixture comes to a boil. Just before it comes to a boil it will become lumpy. Whisk until smooth, lower heat, and cook gently for 2 minutes. Pour into a bowl, press a piece of plastic wrap over the top to prevent a skin from forming, and chill. When cooled, use a rubber spatula to force the cream through a metal sieve, or beat it very well with a whisk to loosen the mixture. Remove the parchment and beans from the shell. Use a spatula to spread a layer of pastry cream in the bottom of the shell, about 1/3-inch thick. Arrange the sliced and peeled fruits over the top. Melt the apricot jam in a microwave oven, or melt in a small saucepan over low heat. Brush tart with the melted apricot jam to create a glaze. Chill the tart briefly. Serve. Don't skip the chilling step, or the dough will shrink and pull away from the sides of the pan during baking. The total amount of cream should be one cup, whipped. Start with about 1/2 c. unwhipped heavy cream, and chill it first to make whipping easier. If you want, you can do what many restaurants do and skip this step entirely by using a vanilla pudding mix. This tart looks like a lot of work, and if made from scratch, it is. 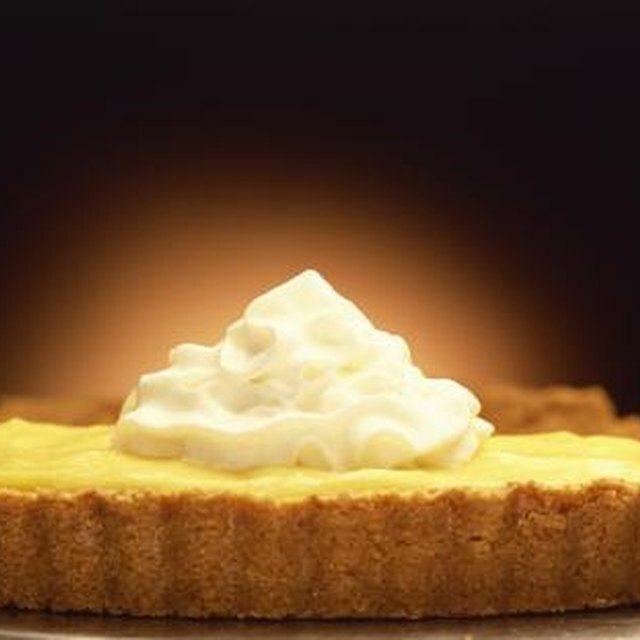 You can take shortcuts, if desired, by using a premade, frozen pie or tart shell as the crust and an instant pudding mix for the pastry cream. Then, all that's left is to peel and slice the fruit and arrange the tart.